You can find the place by taking the D 235 from Ecault to St Étienne-au-Mont. Both villages are south of Boulogne sur Mer. This strongpoint was the commandpost of the 104th Infantery Regiment. It was called Heliotrop and has the number 269. Some bunkers are in a little forest, which in 2000 still was one big unhealthy wastedump. It's now a nicer place to visit and the 117b is accessible although it was partly blown up. On the north side are several Vf bunkers of which one with some nice frescos. 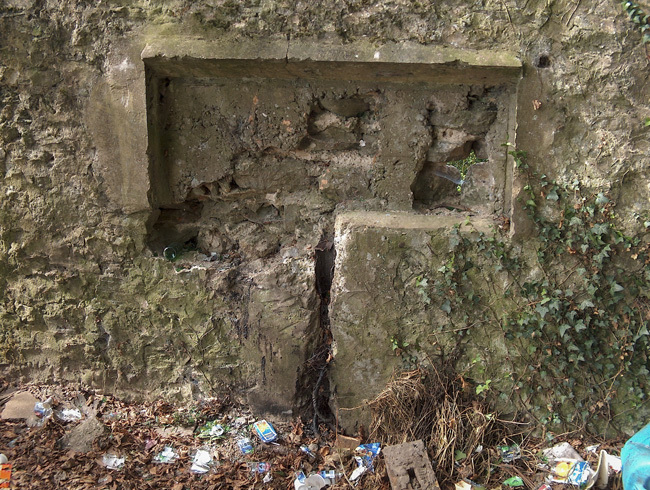 Some machine gun and Pak casemates can be found along the roads around the farm Fringhen. Unfortunately all have lost their armoured plates. Telephone cable coming out of the ground in the wall around the little forest.